The Absolute Best Martini in New YorkThese are the bars that serve the most impressive versions of the world’s most iconic cocktail. 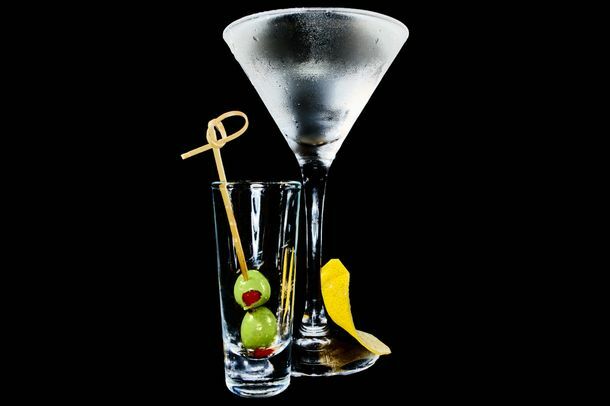 Sloshed: An Actual Formula for Perfect MartinisWe’ve reexamined the king of drinks and come up with a better way to mix them. Mad Men’s John Slattery Isn’t Actually a Fan of GibsonsRoger Sterling is kind of a teetotaler. But Romney Doesn’t Even DrinkPresident Obama uses martinis as metaphor. It’s $10 Martini Time at the Ritz-CarltonCheers! The Franklin’s Extra Credit Turns Learning Into Boozy FunYou can learn a thing or two from drinking cocktails. Lola’s Says Wine Tastings ‘Are for Sissies,’ Pairs Martinis with DinnerNew libations include include the “Sid Vicious” and strawberry shake martini. Show Your Drink RespectGargoyles on the Square’s owner has a very specific martini philosophy. Cheyenne Diner to Rise From Ashes; Lil’ Jon Has a Wine LabelThe Cheyenne Diner might reopen in New York, rapper Lil’ Jon now has a wine label, and the ‘Times’ applauds the return of the real martini. Reality Check: Counter’s $665 Organic Iridium Martini (Yes, $665)How does one celebrate the purchase of a $330,000 truffle? How about with the “World’s Most Expensive Organic Martini,” preposterously priced at $665 (because $666 would be evil). It’s now on the menu at vegetarian hangout Counter, and the ingredient of note is iridium, an element that the menu tells us is “believed to have powered the Ark of the Covenant” (and also “may cause irritation of the digestive tract”!) Actually, it only contains a couple of drops of the stuff, for shits and giggles (you can’t taste it; we tried). So why, then, is the drink so damned expensive?